Every year okPORK members from across the state travel to Norman to be a part of the Oklahoma Pork Congress. After rescheduling the event from February to June, swine producers and okPORK members still managed to make the trip for a fun day of in meetings, meals, learning and sharing along with a new, fun-filled casino night. The day began with an important update form Jarrod Sutton, Vice President of Domestic Marketing at the National Pork Board. His insights on the swine industry and its future all look promising for the growing pork population. Another update was also shared by the National Pork Producers Council’s very own, Dr. Dan Kovich. Dr. Kovich went over what producers should expect in the area of public policy in the coming months. Next on the agenda, Dr. Janeen Salak- Johnson, the newest member of the Oklahoma State Animal Science faculty, shared her research on animal well-being and how production decisions should be made. Even though she did not grow up on a pig farm, her knowledge about large scale production gave hog producers hope about educating young minds about animal behavior and well-being. Lunch had a new twist this year at the 2018 okPORK Congress. Instead of an inspiring guest speaker, okPORK presented its yearly awards. Five honors were awarded during the lunch banquet. okPORK recognized Darren Wheeler, owner of Wheeler Meat Market, as the 2018 okPORK Ambassador Award winner and Senator Eddie Fields received the Outstanding Legislator Award. There were no nominations for the Hall of Fame or Distinguished Service awards, but okPORK came up with a different award to acknowledge pork producers who have made the daily work of hog farming more than just a job. okPORK proudly recognized Robert Teel, Juan Ovalle, Sr. and Sam DeHaas as the Excellence Award recipients. Videos about our Excellence Award winners can be found on our YouTube page by searching okPORK. After the luncheon, okPORK’s Executive Director, Roy Lee Lindsey gave a quick update about okPORK and the Oklahoma swine industry and James McSpadden gave a legislative update on how Oklahoma was coping with the upcoming election. During the business meeting, Keith Reiner and Chris Wallis finished up her term and Angie Johnson, John Hardaway, Jesse Donaldson and Robert Peffley were welcomed on the 2018 Board of Directors. An inside look at how consumers make food purchasing decisions was another new and rather interesting event added on the agenda this year. A group of consumers along with Allyson Perry from the Center for Food Integrity answered the many curious questions from the pork producers, some of which included how the consumers picked out the products they were going to buy. This year’s silent and live auction consisted of more than 30 items and generated more than approximately $4,000. The money from this year’s auction went back to the Oklahoma Pork Council so we can continue to sponsor and host more events across the state. We also had numerous agricultural companies come to the congress trade show to promote their businesses to the many pork producers in attendance. 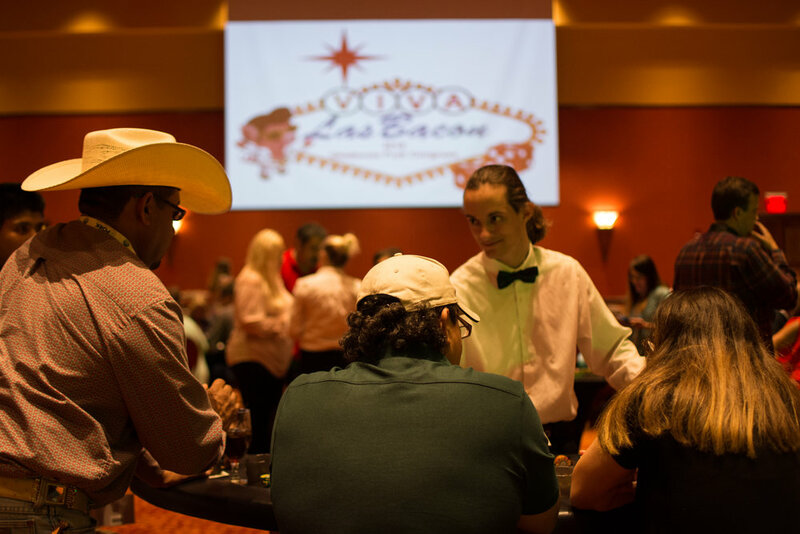 The theme of the 2018 okPORK Congress evening activity was named Viva Las Bacon Casino Night. A fun-filled evening full of food, music and casino themed games including: roulette, craps, blackjack and Texas hold’em quickly took over the room soon after the reception. The players’ winnings were turned into tickets which were dropped in bags to win a different array of prizes from an Ultimate Sandbox adventure to a Bacon of the Month membership. Upon entering the event a single casino chip from every attendee was dropped into a glass pig for a chance to win $1,000 cash, sponsored by Smithfield. Jeremiah Mallard was this year’s grand prize cash winner! If you are interested in supporting Oklahoma’s pork producers or the Oklahoma Pork Congress, please visit www.okpork.org and call 405-232-3781.